Is it time to thin trees and cut off the lower limbs? My answers to these common pruning questions might surprise you. There seems to be an abundance of curious tree pruning advice still around. Let’s try to straighten it out. 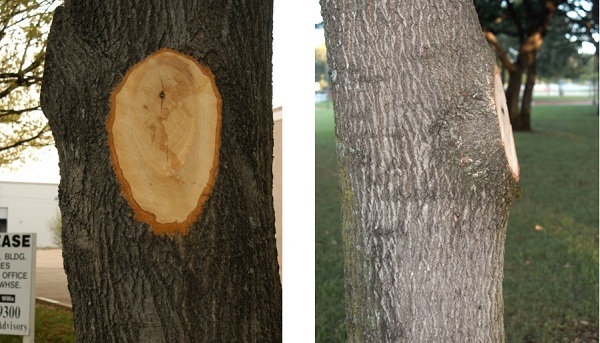 These are two very poor pruning cuts that will probably lead to cavities in the trees. It’s scientific fact that cutting into or removing branch collars cause problems. Flush cuts encourage decay at the top and bottom of the cuts. 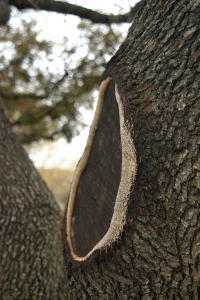 They also destroy the natural protective zone between the trunk and the branch and can cause several serious tree problems including discolored wood, decayed wood, wet wood, resin pockets, cracks, sun injury, cankers, and slowed growth of new wood. Proper cuts are round, smaller and heal much faster. Peach, plum, apricot, and other fruit trees are particularly sensitive to flush cuts. Many fruit tree insects and disease problems are related to improper pruning cuts. Long branch stubs can also be detrimental sometimes and should be avoided; however, it is always better to err on the side of stubs too long rather than too short. CAVITIES: Cavities are often caused by flush cuts. 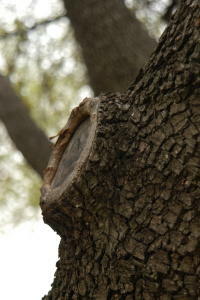 Cavities in trees are voids where fungi have rotted healthy material. They are usually the result of physical injury. Removing only the decayed material is the remedy. Fillers such as concrete and foam are at best cosmetic and not recommended. When removing decayed matter from cavities, be careful not to cut or punch into the living tissue. Injuries to healthy tissue can introduce further decay into the healthy wood. When cavities hold water, drain tubes are sometimes inserted to release water. This procedure is a bad idea. Drain tubes puncture the protective barriers between the rotted and healthy wood and allow decay to expand.